Do you have something that you look so forward to getting in the mail every month? For me it's Bon Appétit magazine. Of course I love getting a letter or card from family or a friend, the cute outfit I ordered online, or that amazon prime package propped up against the door - But without fail, I know I can count on getting my favorite magazine every month bursting with new recipes and inspiration. I just got the hot 10 issue: the annual list of America's best restaurants and I've just booked my flights to go hit all of them. Kidding, but reading through the pages of all the budding chefs and exciting new restaurants like Nonesuch in OKC or Ugly Baby in Brooklyn, has me daydreaming of doing the ultimate foodie trip around the U.S. I also scour all of BA's video's online this falafel spiced tomatoes and chickpeas on flatbread. Thomas and I have been making this recipe on repeat, and it's even better right now with all the end-of-season juicy heirloom tomatoes! If you want a constant stream of incredible recipes and inspo, you can subscribe now for 1 year for both print & digital for only $15! Or 2 years for $24. I am so excited to get my fall issues in the mail and start cooking up tons of hearty comfort food! Combine garlic, sumac, red pepper flakes, coriander, cumin, and 1 tsp. salt in a small bowl. 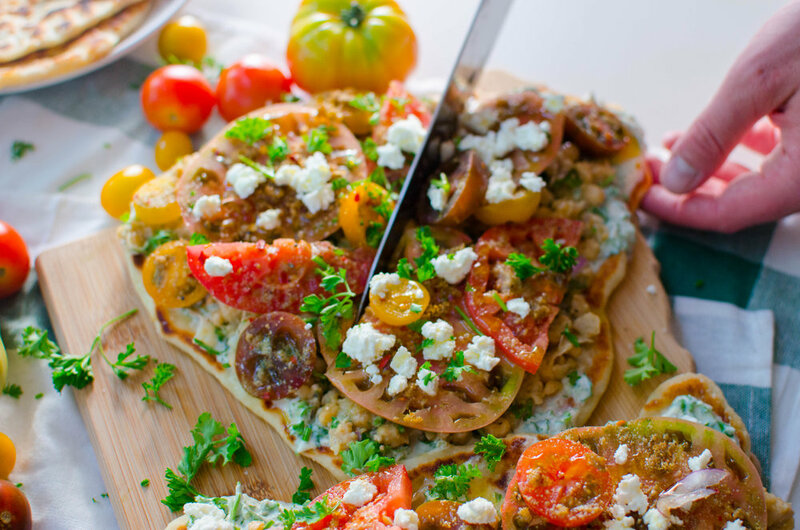 Arrange tomato slices in a single layer on a rimmed baking sheet and sprinkle garlic mixture evenly over top. Let sit at room temperature at least 30 minutes and up to 1 hour. Toss chickpeas and vinegar in a medium bowl; season with salt and pepper. Mash chickpeas with a fork until about half are smashed. Add shallot, parsley, and oil and toss to combine; season with salt and pepper. Set aside. Yogurt Sauce. Combine cucumber, yogurt, mint, and parsley in a medium bowl; season with hot sauce, salt, and pepper. Let sit at room temperature at least 15 minutes. Do Ahead: Yogurt sauce can be made 1 hour ahead. Cover and chill. Warm flatbread in the oven. Or you can make homemade flatbread like the BA recipe originally calls for, but I normally make it easier by buying it remade. 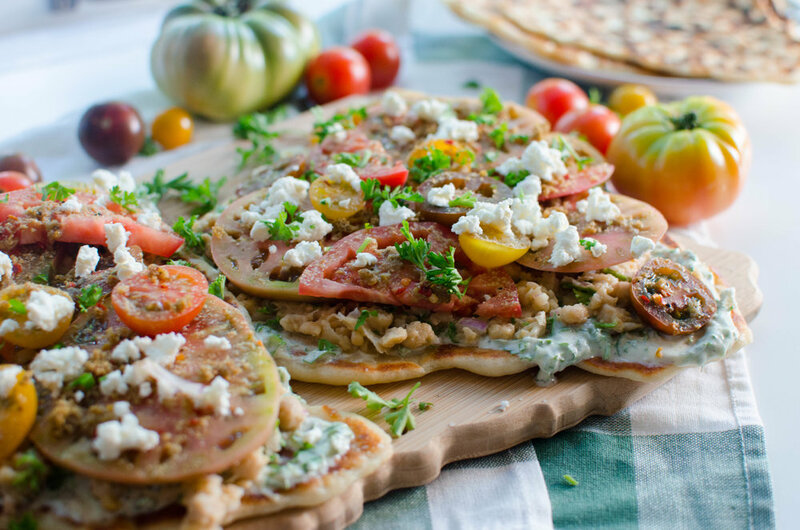 Top each flatbread with yogurt sauce, chickpea mixture, and tomatoes. Top with feta cheese and fresh chopped parsely. Drizzle with more oil and season well with salt and pepper.